Iranian Foreign Minister Mohammad Javad Zarif has reiterated its resolve to support Lebanon saying that the Islamic Republic will stand by the Arab country and is ready to expand its ties with Beirut. 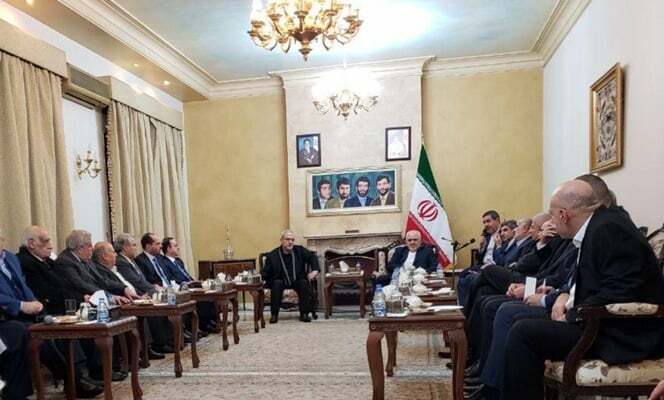 Zarif made the comments in a Sunday meeting with the representatives of Lebanese political parties and movements in Beirut. In the meeting, Zarif expressed satisfaction with his visit to Lebanon on the eve of the 40th anniversary of the Islamic Revolution which marks the resistance of Iranian people against the hostility of great powers. Zarif also congratulated Lebanon on forming a new government saying that the Arab country is a symbol of resistance and democracy in the Middle East. During the talks, the representatives of Lebanese political parties and movements congratulated Iran on the 40th anniversary of the victory of the Islamic Revolution and expressed their views on the situation in Lebanon and the region and ways to expand ties between the two countries. The top Iranian diplomat is set to meet with Lebanese officials, including his counterpart Gebran Bassil and President Michel Aoun during his two-day trip. Lebanon’s new government was formed in late January eight months after the country’s parliamentary elections.